A solid foundation. Committed to excellence. 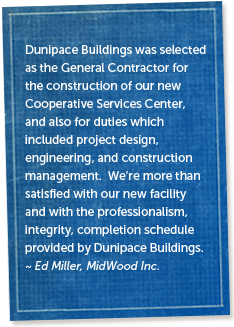 Dunipace Buildings is a family-owned and operated business. Our focus has always been on the customer. The Dunipace team shares decades of experience and a commitment to providing excellent service and a superior product. Situated in Northwest Ohio, we are a Design/Build company specializing in Post-Frame construction. Our buildings are engineered with our customers in mind, not only to fulfill their unique needs, but provide a high-quality structure at an affordable price. Commercial and agricultural structures have been the mainstay of our business. 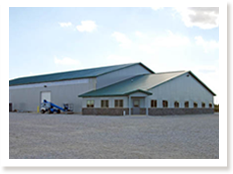 Projects include office buildings, livestock structures, equipment and storage facilities, warehouses, horse barns, and supply/distribution buildings. Our most recent project, which was completed this fall, consists of two buildings – a 17,240 sq ft office and warehouse structure and a 18,768 sq ft fertilizer, blending and distribution facilty. In addition to large-scale structures, Dunipace Buildings provides residential construction services including garages, utility and hobby buildings, painted steel and shingle roofing, and value-added structures such as all-season porches. Please take a moment to browse our photo gallery to view some of the buildings we have designed and constructed. Quality Craftmanship from the Ground Up – our motto says it all. We take pride in the level of service we provide to our customers and quality of our work. Dunipace will walk through every phase of the project with you, from initial concepts all the way to the end, when the last nail or trim work is put in its place.